Outline: Shows the contrast of the two roads; Jesus' companionship on the narrow road. Joy of heaven. Listen, these are words sent to you ________people from the true God. The true God lives in heaven. Hear His good words. He says there are two roads. One road is a good road and the other one is a bad road. One is the Jesus Road and the other one is the devil's road. This bad road is wide and easy, and many people go that way. It is the road everybody in the world begins walking on. It ends in darkness and crying. The people who walk on this bad road carry a heavy load of sin. They do not love God. Their talk is bad. Their hearts are evil. They will not choose the Jesus road. If they do not listen to God's words, they will go to the place of pain and darkness forever. This road will lead them there. 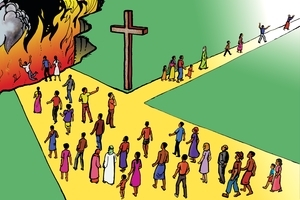 Those who take this road will never go to heaven to live with God. They will suffer in hell (place of fire) always. But the Jesus road is narrow. There is not room for sin or anything bad. On this road you must not hate people or have evil thoughts because this road is a good road. It is the road where Jesus walks. You cannot see Him, but He walks with you. Jesus is your companion. He loves you and takes care of you. He has more power than anyone else. He will not let any evil hurt you. You stay on this road until you die and then you go right into heaven. You will live with Jesus and God in heaven forever. Do you want to travel the Jesus road? Open your heart to Him. Invite Him to come into your heart and go with you. Ask Jesus to take away your sin. He will take you from the devil's road. He will forgive your sins. When you believe on Jesus you leave the bad road. You stay with Jesus on the new road. He gives you a new life. He never leaves you. This road leads to heaven. Heaven is full of light. In heaven there is singing and happiness. Jesus says, "Follow Me. Drop your heavy load of sin. I will be with you. I will keep you. I will stay with you always." GRN has recorded a version of this script in 610 languages and dialects. See full list.